COPD (Chronic Obstructive Pulmonary Disease) is an incurable and progressive illness that has, as one of its main causes, smoking. Doctors and nurses use Pack Years to assist with the assessment of a patient's COPD status. This is easy if the patient smokes only cigarettes, however if they smoke other tobacco products, the calculation becomes much harder. 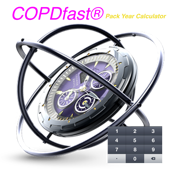 COPDfast® PYcalc™ is a Smoking Pack Year calculator for use by qualified medical professionals, however it can also be used to assist those who want additional help or persuasion in stopping smoking. This calculator allows multiple types of tobacco consumption to be calculated over a given number of years. Most importantly, the calculator allows non-cigarette products to be calculated correctly and quickly. A pack year total is displayed that may be added to the patient's notes as well as any pertinent observation regarding smoking cessation. This system is part of the COPDfast® Suite which offers tools for medical field-personnel across the world. See COPDfast® Lite, COPDfast® FEVcalc™ and COPDfast® PYcalc™ to see if they can help your patients.